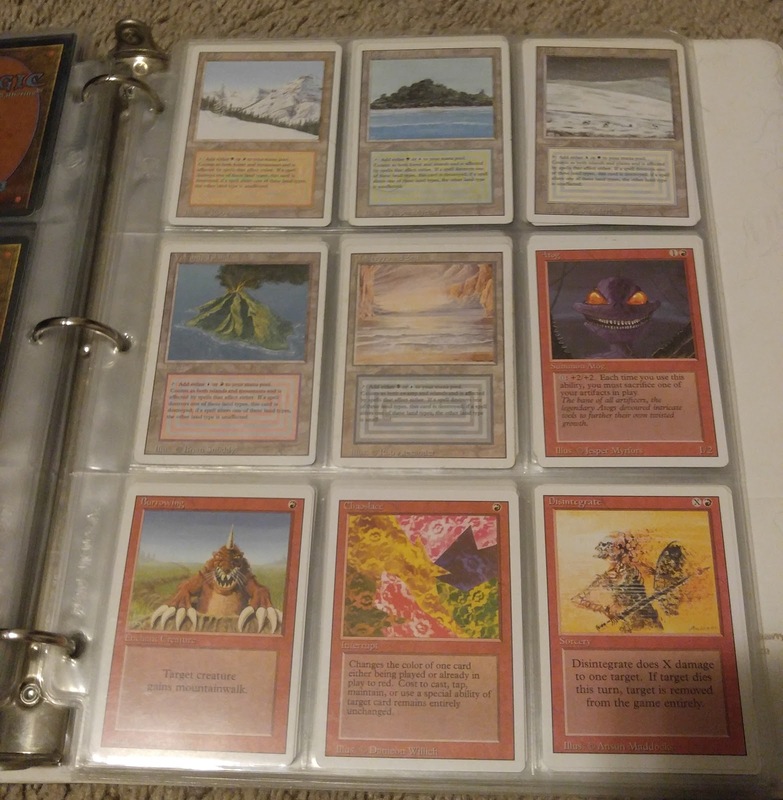 As I have mentioned a couple times before, I used to be the proud owner of a complete Magic the Gathering 3rd (Revised) Edition set. I had forgotten about it for a long time until last year I actively looked for it in my dad's house. 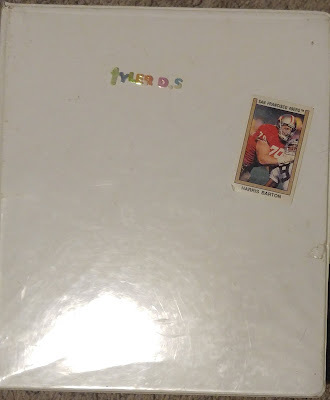 That search is what brought me back into the hobby as I reconnected with all of my old baseball and basketball cards. 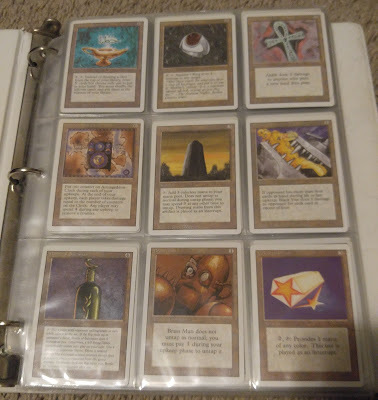 After going through all the old cards, there was still no sight of my Magic cards. I thought maybe my sister took them, maybe they had been sold at one point, or maybe they were truly lost. 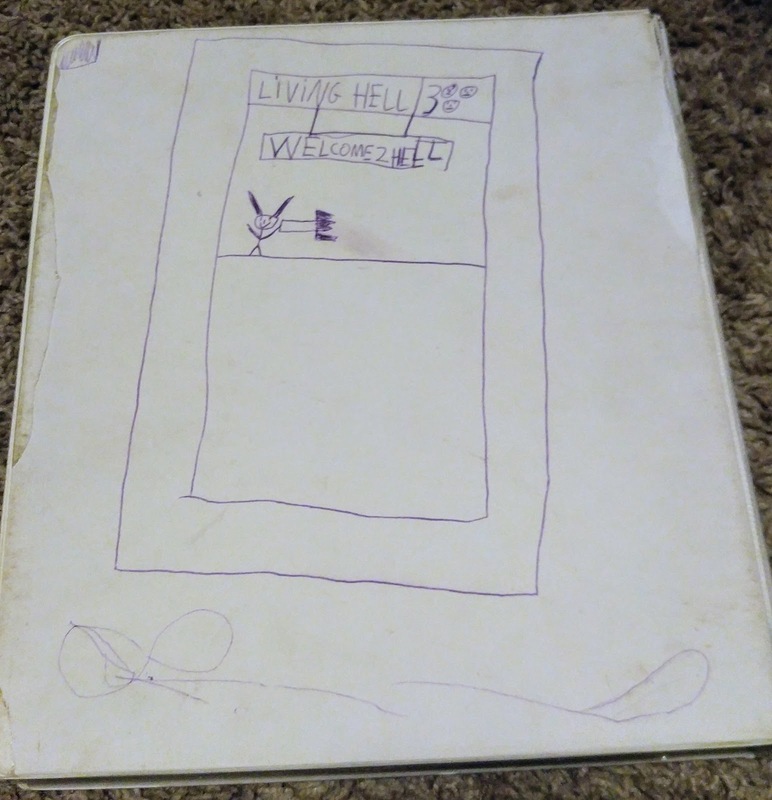 Since my father passed away in January, my step-mother has had the very unfortunate and difficult task of going through not only my father's things but everything else in the house as well. Books, boxes, nick-knacks, who knows what. It's remarkable how when you own a house, you find a way to fill all the space. A few weeks ago I went down to visit my step-mother as she had found some more things I would want. 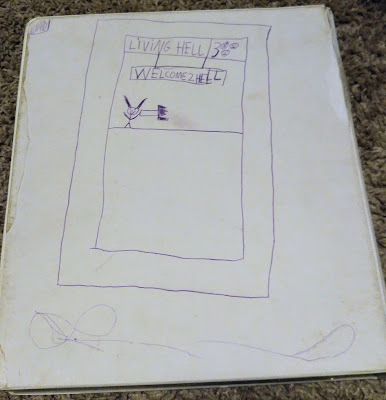 Two of the items she found were white binders containing cards. I'm sure you guessed where this story is going but yes, one of the binders contained my complete set of Magic cards!! They were in the garage the whole time! 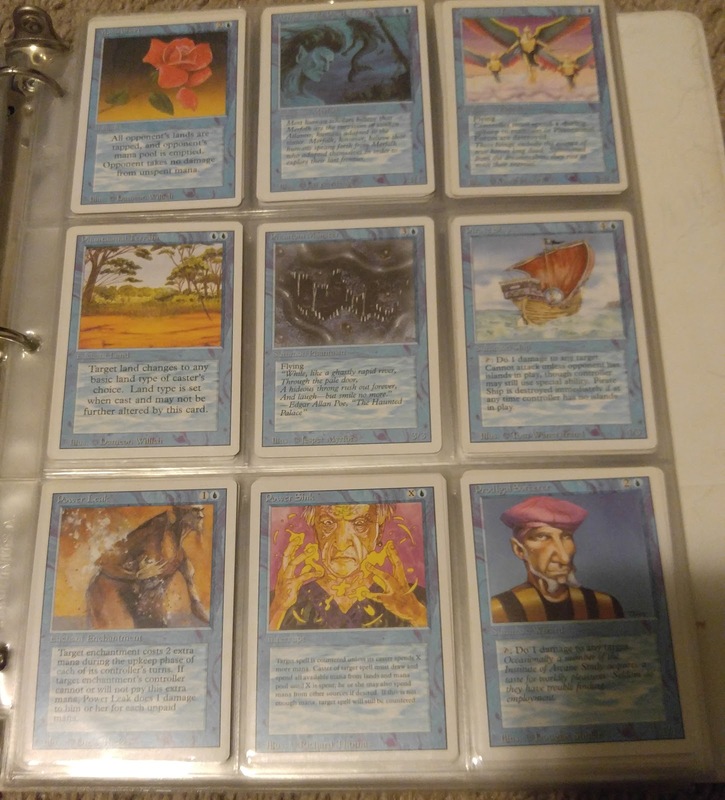 I haven't verified that all the cards in the set are there but I am 99% sure I have the whole set. I have all of the dual lands cards, which were hard to get back in the day, so that makes me confident all the cards are there. As much as I am glad that the cards have been found, I don't know how much longer I will keep them around. 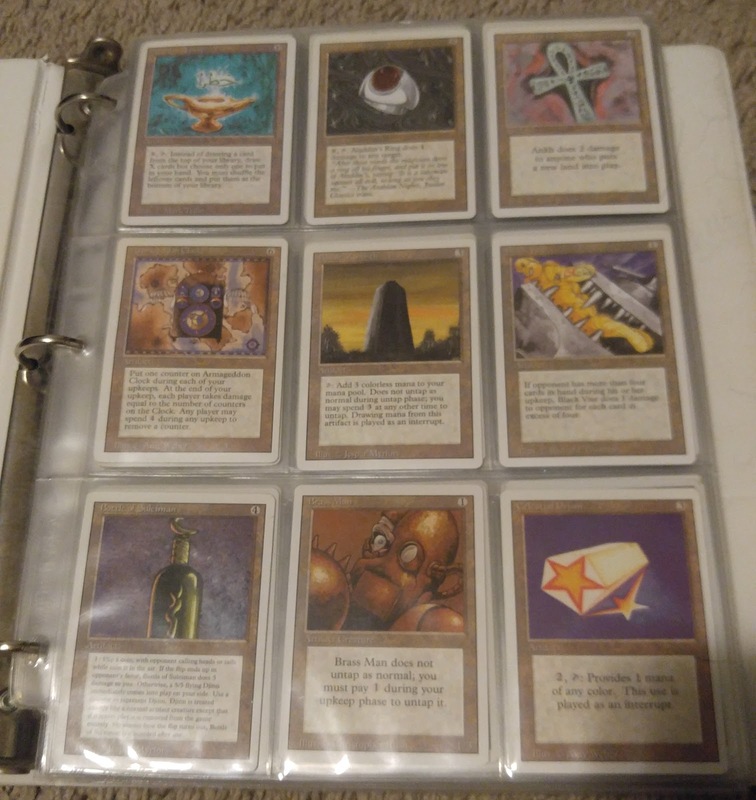 Aside from the nostalgia factor, I don't have any need to keep Magic cards around. I'll sell them off and hopefully people are still interested in buying these cards. One other thing I found was my attempt at designing my own Magic cards. 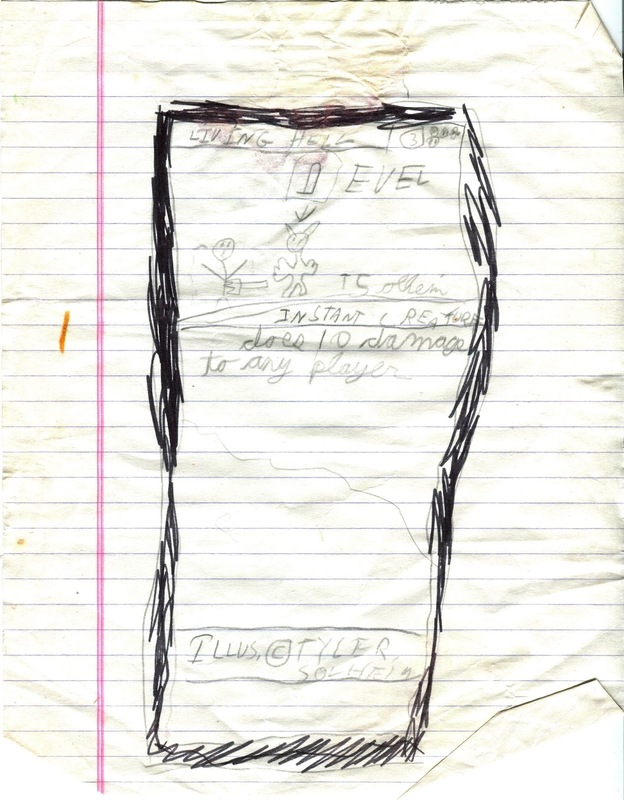 I don't recall my inspiration. Maybe I was feeling angry? May has surprisingly been a busy month for myself. During the first week of May I headed down to San Diego with my wife and her parents for a nice, relaxing getaway. Then after I got back the weather started to shape up, which meant getting outside more to take advantage of the weather before it goes by too quickly. That also means that cards have taken a backseat in the car that is life. I have picked up some cards here and there so I will show some of them off. My first time to San Diego was fantastic. It was even made better by what else? Baseball. 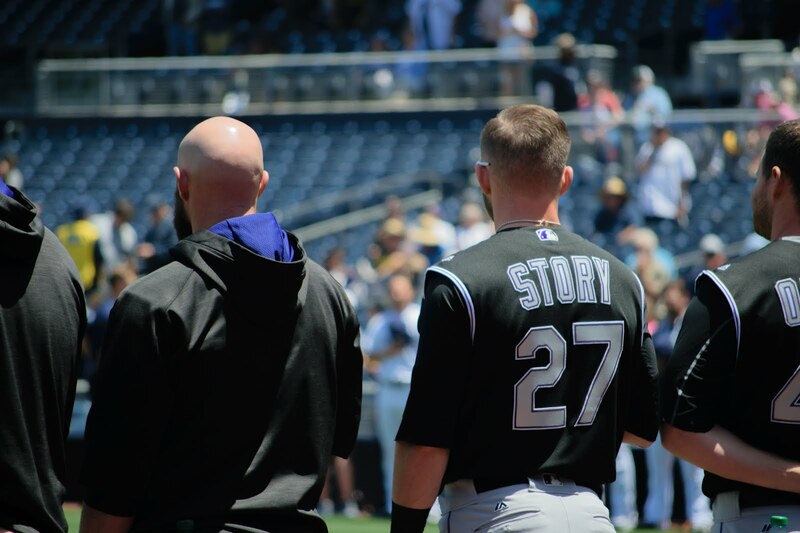 It wasn't planned this way but our trip happened to coincide with a Padres home stand. 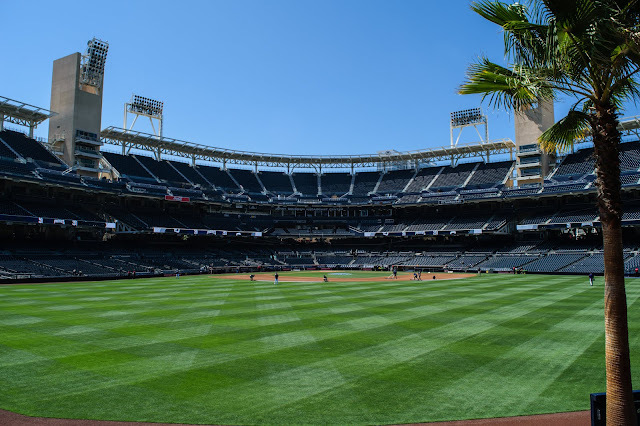 I've never been to Petco Park so I told my wife the only thing I wanted to do was attend a baseball game there. I found a ticket for a day game against the Colorado Rockies. Knowing I would not visit again soon, I picked the best seat I could without breaking the bank. I ended up finding a seat right next to the Rockies dugout, row 7. Technically there were only two other rows of seats in front of my so the view was incredible. 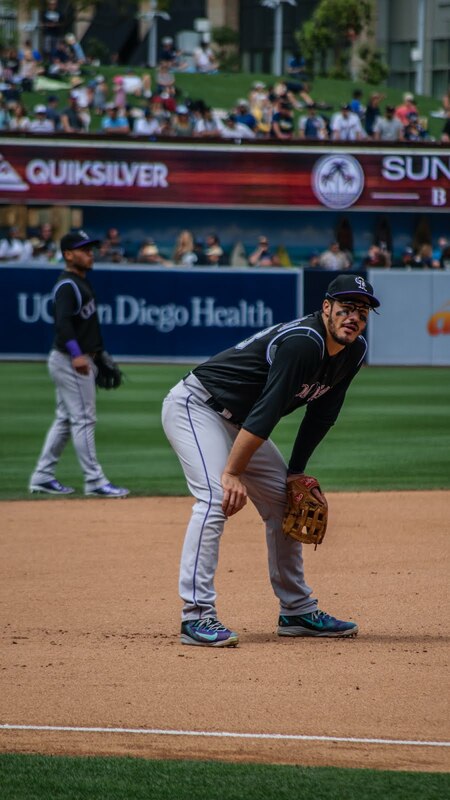 I was so close to the field that I was even on camera at least once. 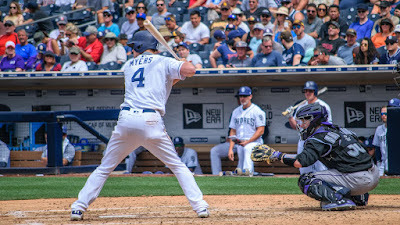 This particular shot occurred during the bottom of the 9th in a break in the action after Hector Sanchez let his bat slip and it hit a lady in the stands. 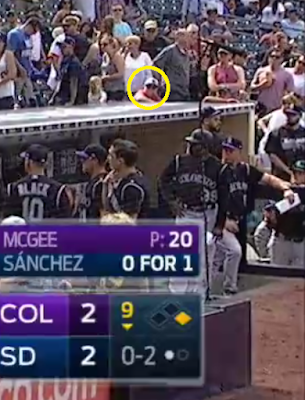 There I am inside the yellow circle rocking a Padres hat and sunglasses. Everyone is concerned, looking at the woman who was hit and I was just thinking "how long is this going to take?" I'm sure there were other times when the camera caught me given my placement. I had a great view of Arenado's defensive skills at third base. All of those shots I took my from my seat. Watching the game felt all too familiar as a Mariners fan. 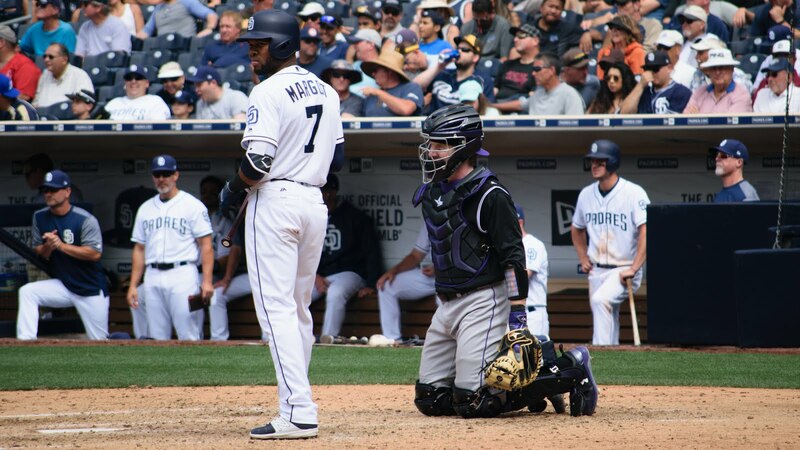 The Padres had trouble getting hits and missed opportunities when they finally did get on base. 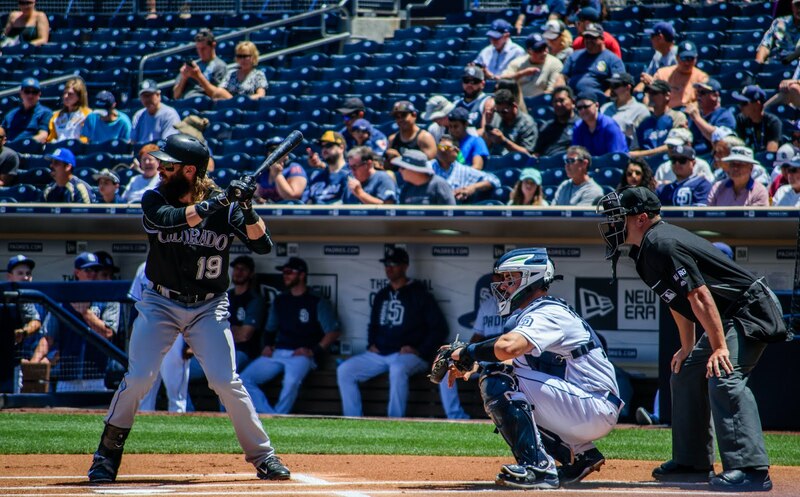 In the bottom of the 9th with the bases loaded and either one or two outs, San Diego couldn't close out the game. They went on to lose it in extra innings. 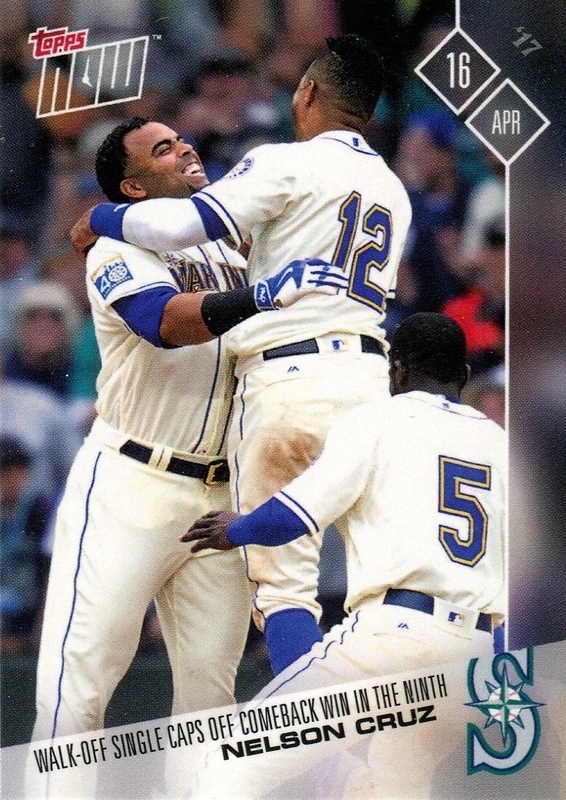 That sort of disappointment is vintage Mariners. 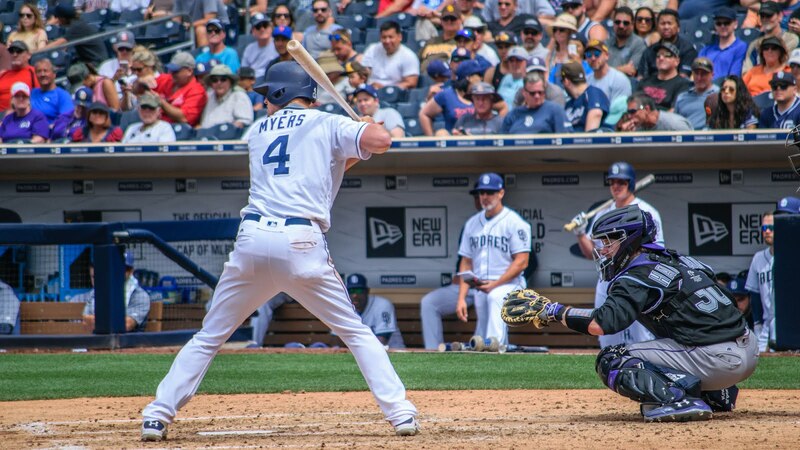 Even though the Padres and Mariners are considered rivals for the purposes of interleague play (I know, it makes no sense), I now consider myself a Padres fan. The ballpark was enjoyable, the city was nice, and the team has some likable players. 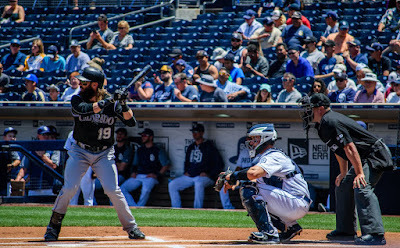 With the Mariners and Padres similar struggles with success and perennial underdog status, I couldn't help but embrace the Padres. Plus, I didn't really have any NL team that I felt strongly about. The Padres are not well represented in my collection (currently ranked #22) so next time I am at a card show I'll be on the lookout for any cards of current Padres players. 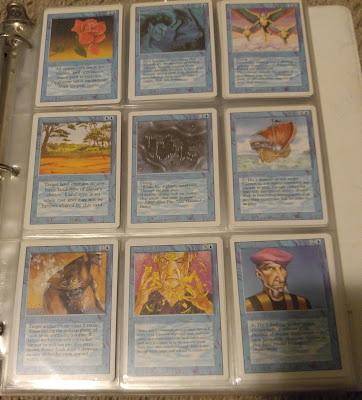 Since this is a card blog, I owe you all some pictures of cards. Here are a few cards I have received lately. A batch of 2017 Topps Now cards. Did you know that Ichiro has as many Topps Now cards of him at Safeco Field as the Mariners have in general? Yup. 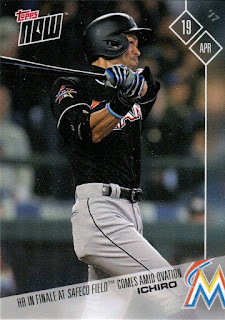 The Mariners have two cards this year and Ichiro had two cards this year when he returned to Seattle. Topps isn't all to blame as the Mariners have been lackluster this year. I've set an eBay reminder for 2008 Topps printing plates as I would love to be a super collector of anything and everything 2008 Topps. Printing plates show up often on the site but I ignore any ones over $10. 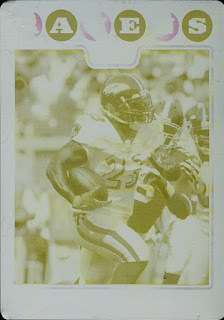 I think this Willis McGahee yellow plate was right at $10. 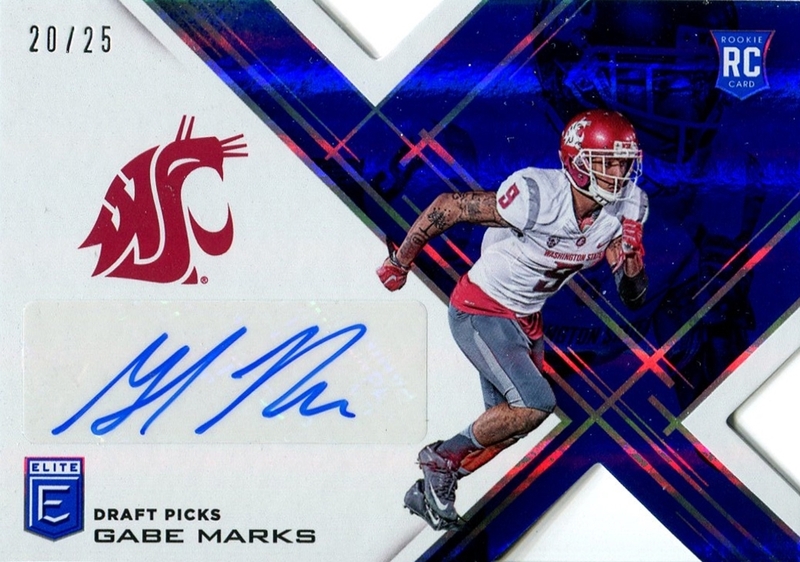 That seems reasonable enough for a 1 of 1 card. 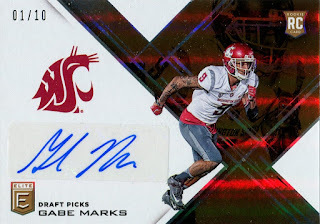 Gabe Marks, the standout wide receiver from WSU made his way into a few Panini products this year, including 2017 Elite Draft. Marks was featured in the autographs insert and with the dizzying array of parallels Panini puts out there have been plenty of cards from which to choose. Here are a couple of the more short printed cards. That is it for cards. Thanks for reading!